Continental AG provides the Volvo XC60 with an accident-prevention system that the Swedish automaker calls City Safety. The system uses a laser fitted behind the rearview mirror to detect obstacles up to six meters (about 20 feet) in front of the vehicle. City Safety engages the brakes if a collision is imminent, thereby lessening the impact or preventing a crash altogether. The system is key because three-quarters of all collisions occur at less than 30kph. 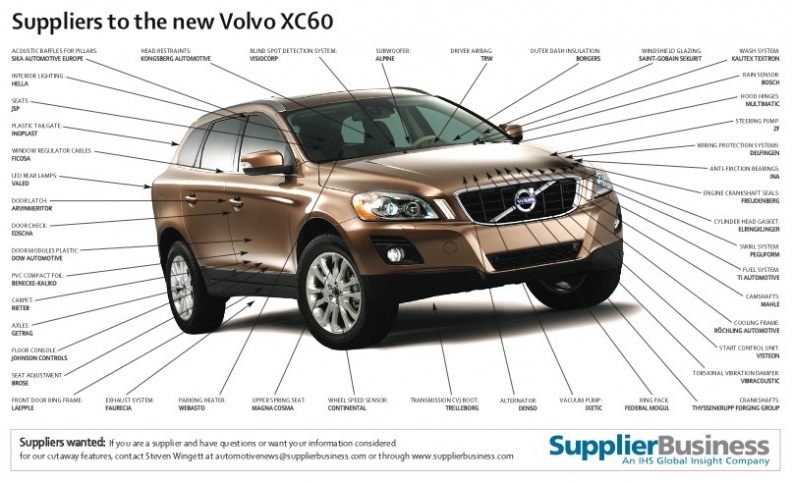 The XC60 is the first production car to get the feature as standard equipment. In addition to braking, City Safety communicates with the airbag control unit and other safety features to prepare the car for impact. The XC60 also has Haldex AB's fourth-generation electronically controlled all-wheel-drive system. An advantage of the Swedish supplier's system is that it does not need any differential speed between the two axles to engage, allowing instantaneous full torque transfer to the rear axle from start. French glass maker Saint Gobain-Sekurit, which is a subsidiary of France's Saint-Gobain SA, helps improve visibility in the car by offering optional front door windows that have a thin, transparent hydrophobic coating. The coating causes water drops to turn into larger spheres that blow away at speeds above 50kph. Numerous suppliers' new designs ease assembly of the car. For example, Inoplast, a division of Plastic Omnium Co., equips the XC60 with a composite tailgate module. The design allows the integration of the power unit for the motorized version within the tailgate module. Consequently, Volvo can manage the motorized version of the tailgate alongside the manual one without different body-in-white configurations. The tailgates are manufactured at Inoplast's plant in Saint-Desirat, France. Volvo assembles the XC60 at its plant in Ghent, Belgium. Prices in Germany start at 32,900 euros.